Every issue of Linux Voice 1-32! Since 2014, Linux Voice has been a resource to the Linux and Free Software communities. Now you can get all of the news, reviews, tutorials, and insightful articles you may have missed on one fully-searchable DVD! This powerful DVD includes every issue in ePUB and PDF format. You'll get access to 3+ years and more than 3,000 pages of content on one DVD! 3,400 pages of Linux and Open Source love! 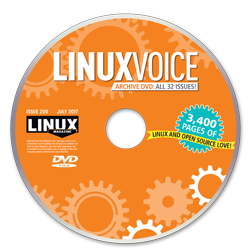 We are pleased to offer the complete Linux Voice archive on a single, searchable DVD. Founders Graham Morrison, Andrew Gregory, Ben Everard, and Mike Saunders believe that "passionate communities deserve passionate magazines." That's what Linux Voice has delivered to the Linux and Free Software communities. Since April 2014, Linux Voice contributors have introduced readers to the very best that Free Software has to offer. Now you can get all that knowledge on one fully-searchable DVD – EPUB, PDF, and HTML formats included. If you love Linux and open source, you'll love Linux Voice and won't want to miss the chance to browse this comprehesive collection of issues 1 through 32!